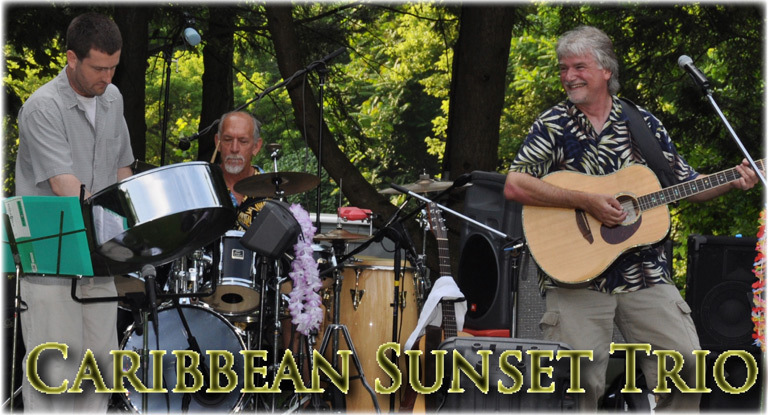 Caribbean Sunset, as the name implies, is the perfect choice to provide a live tropical setting to any type of event. The heart of the ensemble is the pairing of Singer/Songwriter/Entertainer Mark James with the accomplished Steel Drum of Kristian Paradis. The playlist is a combination of authentic Caribbean standards, select Jimmy Buffett covers and Tropical Jazz carefully chosen to compliment the particular event and desired texture. From a cocktail party to a luau dance to a wedding or a concert show, the appropriate material is delivered with a personal interactive warmth, integrity and enthusiasm that few bands can provide. The players love what they are doing and the audience loves the performance. Caribbean Sunset is available from a duo to a six piece ensemble depending on the event’s requirements and budget. The Basic Duo is Mark on guitar and Kristian on steel drums providing both vocal and instrumental material as the situation dictates. Popular Trio choices are to add a bass player for a more subdued, full, listening/background sound or add a percussionist for a more lively and aggressive group. The Quartet (bass and percussion) is the recommended minimum for dancing and the addition of the pedal steel guitar and keyboard/sax is the best choice for a full Stage Show. Mark James has been entertaining audiences across the country for over 30 years. His early roots are in country fairs and festivals. On the road in the 80s, he expanded his repertoire through show and dance bands performing the “Sheraton Circuit” and Atlantic City. Touring with the Bobby Mercer Road Show, Mark worked “one nighters” with notable stars including Lee Greenwood, Marie Osmond The Four Tops and many more. Over the past 10 years, he has been concentrating on the tropical side of life working with singer/songwriter John Frinzi and touring with the tribute band Parrotbeach. Caribbean Sunset provides the platform to take all this past experience to create his own musical direction. Marks warm, veteran stage presence pulls the audience into the performance with humor and excitement. Kristian Paradis is the director of the University Of Delaware Steel Drum Band. Kristian has performed around the world with the US Navy Band, including a residency in Japan for four years. Creating, arranging and directing all sizes of steel drum bands, he has worked and studied with many of the greats in the industry including Andy Narell. His extensive knowledge and expertise on the steel drum and Caribbean music provides a much sought after authenticity to all of his projects and playing style. Kristian attacks each show with a precision and conviction that touches the listener. A NOTE ABOUT THE LIVE FILES: The above demo files are of the trio (Acoustic Guitar, Steel Drum and Percussion with Vocals) recorded live from the stage on a Tascam DR-1. The recording quality reflects the live nature of the event and the device to demonstrate actual performance vs. studio enhancement. No tracks or overdubs were used in any of the above recordings.